The West Wing, East Wing and every room in between have been decked out in elaborate decorations to celebrate the holidays, and President Trump and First Lady Melania are preparing to celebrate the holiday with their family. This year's official theme is "Time-Honored Traditions," and there have been plenty of traditions through the years at 1600 Pennsylvania Avenue. Calvin Coolidge was the first president to instate a public Christmas celebration at the White House, with the first National Christmas Tree lighting in 1923. 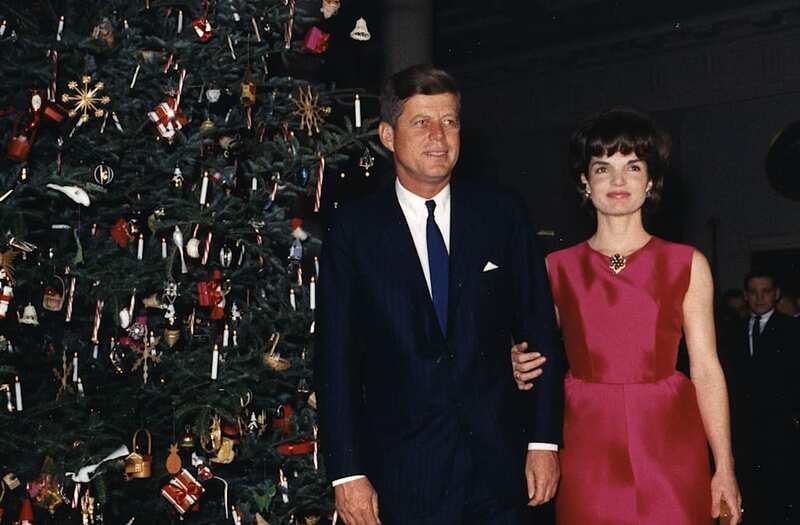 First Lady Jacqueline Kennedy took White House Christmas decorating to a new level when she started selecting holiday themes. In 1962, the White House Christmas tree was decorated with ornaments inspired by children, including candy canes and gingerbread cookies. Lyndon B. Johnson and his family stayed in D.C. for the holidays in 1968. Christmas in the Nixon White House was a lively affair. First Lady Pat Nixon told 'Empire Magazine' their holiday traditions included the president playing 'Rudolph the Red Nosed Reindeer' on the piano for friends and family. Pictured: Nancy Regan sitting on Mr. T's lap in 1983. The Reagans also commissioned artists to paint scenes from inside the Executive Mansion during the holiday season for their annual Christmas card. Many presidents, including Barack Obama, Bill Clinton and both George W. Bush and George H.W. Bush, have since followed suit. Christmas during the first Bush administration was a family affair. Here, George H.W. Bush shows his grandchildren the Oval Office Christmas tree. George Bush Sr. celebrated all four of his Christmas' as president at Camp David, plus eight more holidays while his son was president. The Clinton White House was adorned with plenty of edible decorations. Over the course of several years, the Clinton's enjoyed gingerbread house versions of the Washington Monument, Mount Vernon and even a replica of Hillary's childhood home. George W. and Laura Bush celebrated a patriotic themed Christmas in 2008 to commemorate their final Christmas in the White House and the election year. The Obamas celebrated friends, family and the freedoms enjoyed by Americans with their 'simple gifts' White House theme. The official Christmas theme this year in the Trump White House is "Time-Honored Traditions," meant to celebrate 200 years of White House holidays. "We want to wish everybody a Merry Christmas, a Happy New Year," Trump said at the National Tree Lighting this year. "Have unbelievable holidays."